KALABURAGI, Karnataka: Registrations of certain medical practitioners and hospitals in the district hangs in balance with the district authorities taking strong cognizance of the hysterectomy surgeries being conducted in the area without proper investigations as well as hospital records. So much so that the district authorities have written to the Karnataka Medical Council asking them to take disciplinary action against the erring doctors as well as cancel the registrations of the four hospitals in the city. A recent report in Indian Express states that Deputy Commissioner Ujwalkumar Ghosh had written a letter to the chief of Karnataka Medical Council, H Veerabhadrappa, on January 23 recommending him to take “suitable action” against general surgeon Girish Noola and gynaecologist Smitha Noola who allegedly conducted nearly 600 hysterectomy surgeries in two years, some of them on young patients without proper investigation and without maintaining proper records. Ghosh also pointed out in the letter that in this regard, an investigation was conducted by a special investigation team that was constituted by the state government under the the chairmanship of Deputy Director of Mental Health, Bengaluru, Dr Ramachandra Bhairy, who had submitted their report to the Commissioner of Health and Family Welfare last year. Liquid waste management system was not maintained properly. Express adds that the government is currently mulling over the proposal of whether compensation should be provided to the victims of these hysterectomies. This investigation reported by The Ujjwal Kumar Ghosth about the corrupt practices done by the Director of BRIMS BIDAR was catching Dust in the locker of the Minister for Medical Education . There were Doctors From the neighboring states who enjoyed huge amount money in the form salary being away from the Institution. This college being 10years old still managed to get 100 admission annually just by undertaking to construct Teaching Medical college HOSPITAL. Till date, more than 10years still they are managing in same old 300 BEDED district hospital. With substandard facilities, infrastructure and local Praticeners as Teaching Faculty. Despite so many problems still this college is got permission from the MCI. There is something really wrong with the system. That\’s it always makes me bother about the increase in number of Qualified QUACKS. It is dangerous development in the country. An ILLTRAINED Doctors are more dangerous than the militants. Look at the destructive surgeries done by these DANGEROUS DOCTORS. I am sure they will be left FREE with minimal penalties. This part Karnataka the few communities / castes can get away from anything being close the local Politicians of the same caste or community. Starting politics, running profit making professional courses like MEDICAL ,Enginering , and other colleges and important posts in the Government are Managed by them.It is open secret , Unfortunately both the bigger political parties support such communities at the COST of others. With this kind of mind set India can never be decent country to live for the Majority of the population. 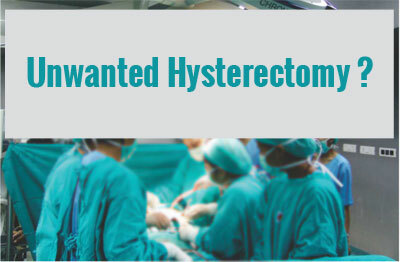 The NUMBER of Hysterectomies in this MEDICAL COLLEGE is almost nil . For that matter there are hardly any note worthy activities happened as it should have been happen in the Teaching Medical college hospitals/ tritiory Hospitals. In our country telling truth is more of a crime. And supporting the Rascals , rogues in well appreciated. Even God cannot save this country. Because The place of worship is managed ( MISMANAGED) by the crooks, criminals, BASED on caste and community. totally true. but many females opting for it because its included in healyh scheme. Sad but it is just one example of immorality in society which measures d success in terms of money making in a scenario now following privatisation of medicine with hefty capitations. Since hysterectomies are non emergency surgery, prior sanction may be made mandatory from a State appointed expert committee to prevent such unethical practice.